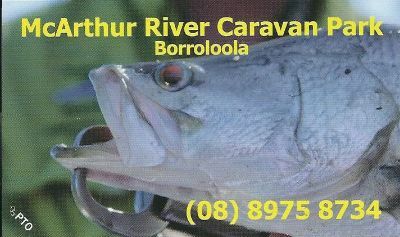 McArthur River Caravan Park is the place to stay if you are serious about your fishing. Located in Borroloola on the McArthur River, this place lives and breathes fishing. The closer you are to the river, the more time you spend fishing and the less time you spend driving. After all, when the day is done, you want to be back at camp enjoying a cold one and turning the catch on the BBQ. McArthur River Caravan Park is just down the road from the Borroloola Boat Ramp. Conveniently located in town, you will always be able to grab that forgotten item or stock up the fridge without having to drive for hours. Bait, ice, fishing gear and tips are available in well stocked shop. It is said that there used to be crocs in the McArthur River, but the barramundi chased them away. When the bucket list is all ticked off and someone asks; "Have you been to Borroloola? ", be sure that you can answer "Yes". Please write your message to McArthur River Caravan Park in the message box. We will make sure that they get your message ASAP.